Copyright (C) 2006, David Shields. Promoting Open Technology in Education: One ? per ? Explain key concepts of Open Technology: standards, architecture, source, data formats, collaboration. Show how they can be applied to education looking at some case studies. Suggest how best to deploy, next steps. Standards-based development using open interfaces and specifications. Allows innovation on top of common specifications. Freely available source code for program application, utility or library. Internet has enabled worldwide distribution of content at minimal or no cost. Programs, in source or binary form, are an important kind of open data. Office Open XML formats – ongoing. Components are interchangeable; they can be substituted. Components are independent; you can change one without affecting the others. For example, disk storage from 1 megabyte/$1000 in 1983 to 3 gigabytes/$1 today, factor of 3 million improvement. Same componentization phenomenon in software going on now. These interfaces become instant standard. Enables others to develop hardware. Puts Moore’s law to work in new mass market. Defines how to develop (DOS) and distribute (floppy disk) software for this new kind of computer. Enables “cloning” of hardware, such as portable computer from Compaq, the ancestor of today’s notebook/laptop. In 1984 Michael Dell starts selling plug-compatible PC’s from stock off-the-shelf components. PC “microcomputer” evolves into workstation that replaces minicomputer. Rise of commercial, “shrinkwrap” software. Microsoft goes from DOS to Vista. Cell. Used in Microsoft Xbox, Sony PlayStation. Neutral and unbiased – giving no one entity or vendor an unfair advantage over others in the creation or implementation of the standard. The World Wide Web (W3) is an application built on the internet. Over ninety standards published since 1994.
http://www.w3.org is domain name that resolves to a specific Internet Protocol (IP) address. Software is a special kind of writing that directs the operation of the various hardware components of a computer. Open Source is a kind of software. You are almost certainly using some of it every time you use a computer or use the internet. 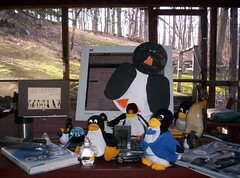 running Linux, an open source operating system). Since software is a form of writing, it is protected by copyright. The author, or copyright owner, sets the license terms. Software is “Open Source” if its license meets the conditions of the Open Source Definition. There are many Open Source licenses though only a few are widely used. Open Source code is usually developed using collaborative community-based approach in which all work is done in full public view. It is usually made available as a downloadable file from the web, or on a CD, or on a DVD. Open-source implementation of operating system kernel, work began in 1991. Supports many Unix-related standards such as the IEEE POSIX standards. Many kernel developers are corporate employees, using shared R & D model to enable Linux for the enterprise. Linux growing several times faster in server market than total market and faster than Windows server. Customers asking for Linux led to greater IBM involvement to provide more options to customers by making Linux more enterprise-ready. Most widely used HTTP Web server (for over a decade), see Netcraft Apr ’07. Apache also sponsors many other projects, including XML and Web Services, databases, and so forth. IBM’s first serious engagement in Open Source was replacing the proprietary Notes Domino Web Server with Apache’s server in mid-1998. Widely used. One of first open-source applications to achieve wide use on the desktop. The term “open source” was created in early 1998 when Netscape decided to release the source code for the Netscape browser as a competitive response to Microsoft’s Internet Explorer. Mozilla evolved into today’s Firefox browser, Thunderbird e-mail client. Support rapid adoption of open standards by providing easy access to high quality open source implementation of open standards in order to speed industry adoption. Encourage open source implementations of standards and so use open source to support business and strategic goals. Use open source as business tool by keeping platform open and to take advantage of new business opportunities. This encourages choice and flexibility in meeting customers’ needs. Enhance mind share and work with open source projects, build relationships with the community of developers. Become strategic player, both as contributor and consumer of technology. More than 1000 IBM developers involved in OSS projects. IBM leads over 80 projects. IBM contributes to over 150 projects. Very mature open source packages available for infrastructure and tooling, especially in the application and web server space. Open source used to create initial “reference” implementation. If good enough this can become the most widely-used, standard implementation. Just as with hardware, some components become commodities. Programming applications increasingly based on component creation and integration: distinguish standards-supporting versus value-add components. Open source “stack” available from the smallest embedded computers to supercomputers, from system startup to enterprise applications. Encourage like-minded companies within an industry to collaborate on development of common business functionality. Share common development method and open standards. Utilize a common value-based approach supported with partner or peer. Products and solutions moving toward hybrid mix of open source and commercial components. Commercial vendors: create software that is innovative, meant to differentiate the vendor and deliver value to the clent. Can use non-differentiating open source components that implement and support standards. Open Source projects/vendors create software through open, collaborative communities driving evolution of standards and innovation. Choice no longer just build or buy, can now integrate and even share components. Opportunity to develop and enhance service business. Industry evolving. What is the right mix? Rapid prototyping lets you try things out with small investment. One model now in wider user is to develop using open source, deploy using commercial software. Peer review of source code enhances quality. Broad community testing helps discover bugs. Fast cycle time of releases and fixes encourages wider use. Adoption encourages others to join project. Commercial developers may have little experience. New developers probably have some experience as open source. Sustainability — will it be available five years from now? How can IT help our business succeed? How can we improve our IT infrastructure? Should we use Open Source Software? How much will it cost / TCO / ROI ? How to acquire or learn needed skills? Evaluate Open Source and Commercial software options – be pragmatic. Most customers are using a mix of open source and commercial source.. The open source may be found embedded within commercial source. Don’t build a separate strategy – interoperability / migration considerations are important. Balance up-front costs against recurring costs. Open, robust communities and broad industry support are important. Sustainable business models are also important. Look for healthy ecosystem of vendors, service suppliers, and business partners. Need a team: business, technical, legal. Run proof of concept or pilot to test viability. Make decisions based on both business and technical factors. Web 1.0 began as effort by physics research lab CERN to share information about research. Wikipedia is an example of open content. Web 2.0 — work in progress. Content Management System (CMS). Drupal, Joomla. Part of open technology is the use of open data formats, the web being a prime example. Data formats are important in many other areas; in particular in the need for institutions that archive and maintain public records that go back decades — and in some cases centuries — and which need to be preserved in a public form indefinitely. For example imagine if Lincoln had used Powerpoint: The Gettysburg Powerpoint Presentation. By the way, I prefer the open format HTML. It is good enough for me and no one need download or buy any software to read it: they can just use their browser. In an environment where a single word processing application is widely used, organizations have largely defaulted to storing their documents in proprietary file formats. A weakness of this approach is that if a user were to employ an application that does not use the same file format, then that user would not be able to efficiently collaborate and exchange data with colleagues. In situations where different proprietary formats are used, the search, retrieval and re-use of vital information stored in documents can become difficult if not impossible. Problems only compound when maintaining archival data in a proprietary format, as may need not only to maintain the data but the software used to access that data, and the operating system software on which that software runs, and the hardware that can run that operating system, and associated skills. Adobe announced in January 2007 that it would submit PDF as an open standard: Adobe and industry standards. Source), Andy Updegrove, Sam Hiser. Profile: 11000 students in 15 K-6 campuses. IT group manages 800 staff accounts, 11K student accounts, authentication and authorization for 50+ programs. Problem: District was using Novell Netware solution, but worried about continued support for education. Decided for migrate to Linux. This done in 2Q 2004. Decided to use RedHat Enterprise Linux (RHEL) for servers, Fedora for desktops. Rollout started with non-essential edge servers, worked way to core, testing and developing expertise on the way. Migrated 14 school sites and 42 servers over six weeks during summer. Now almost all Linux, with a few Windows servers running legacy database apps that are not yet Linux ready. Staff receptive, especially since much of migration transparent (Windows users still saw Windows servers, as did Mac users and Mac servers). Easy migration to use Open Office (OO), and configured OO to save documents by default in MS Word format (hope to see standards-based format supported by both OO and MS Office). Maintenance: use RedHat network for automated updates and patches. Use cron scripts to update student desktops; use VNC to access desktops. Virtualization: Moving from several servers to blade servers, plan to use Xen to run virtual machines to bettter manage server resources. Linux on student desktop: Plan gradually migration, using Linux to extend shelf life of older computers. Plan to set up complete lab using Linux Terminal Server Project (LTSP). Customization: Modfied perl scripts for editing Samba accounts on the LDAP directory. Extended to exchange information with some of their web apps. Time savings: Servers easier to manage. Single server management and configuration tool. Cost savings: $54K/year for Novell licensing costs, estimate $50-$200/year per desktop by using OO and other Open Source software on desktop workstations. Community: Spirit of “Open Community” beginning to catch on. More sharing of lesson plans, new uses such as using Audacity (from the OpenCD) to record podcasts of class review material. Happy with results, felt research, planning and early experimentation important. So happy that “would not be so cautious next time” but would try newest beta releases sooner. Every time they looked for an open source alternative they found one. Indiana sponsors one of the most extensive statewide programs to provide class sets of low-cost student workstations using Linux on the desktop. Has placed more than 22,000 workstations in 24 high schools across Indiana. fully equipped with non-mobile workstations. The workstations are used for online research, frequent writing, and collaboration. Indiana has just over one million students in public schools, with 300,000 high school students. The majority of schools have a student-to-computer ratio of between 5:1 and 8:1. About half the computers are in a lab environment. Computing resources were either overbooked or not reaching students. Students were spending an average of only 35 minutes per week using computers. Often the few classroom computers were used with early finishers and occasionally for special projects. Considered individual laptops but rejected on basis of cost and security issues. Decided to focus on 1-1 (one computer for each student) in language arts. Create grant program so schools could purchase low-cost computers using open-source. Provide up to $190K/grant to equip five classrooms with 30 stations in each. One quarter of budget for professional development. Goal to keep software costs to $5/year. Initial cost $400-$600 including desktop running on commodity hardware. Using Gnome, KDE, Star Office, Moodle, GIMP, IHMC CMAP (CMS), Crossover Linux (to run Win apps). Provide choice of Linux distros: Novell, Linspire, RedHat, Ubuntu. State provides images to format hard drives. Schools given freedom to come up with their own plan. Pilots for two years starting in 2003. Program going strong today. Computers 300 300 150 120 ? Key: MI, Michigan City; CH, Connersville HS; RC, Rush County; ACc Alexandria Community; MC, Monroe County (one of few all-MS sites in program). State did allow funds to be used for a few applications such as Criterion that were known to be of value in one-to-one context. Teachers were using MS Office, students MS Works, which caused compatibility problems. Moved to StarOffice for all. Relying on uniform images, remote installs and refresh at start of each school year. Remote installation makes it easier to update and maintain large number of machines. Server-based approach (LTSP,Ardence) eliminates need for hard drives in some workstations. Schools use StarOffice (SO), an enhanced version of Open Office (OO) , since Indiana has statewide license for SO. Schools adding up to 300 new machines but none have to add additional support staff. Students more engaged when have good computer access. Believe that many of the benefits were due to the use of the one-to-one approach. Expect statewide increase in 2007 from 24 to 80 high schools in program. Collectively they comprise Open Technology 1.0, the technology that was used to build the modern Internet and web. The internet and web themselves have become part of Open Technology. These technologies are being further refined and extended today as the Open Technology 2.0 that forms the base technology for Web 2.0. Perhaps the single best demonstration of the power of open technology is a Linux server running on commodity hardware: Open Technology in a Box. Note that ALL the applications of open technology mentioned in the two Case Studies discussed above involve the use of Linux servers. What next? How can we be more effective in providing education about open techology and its application in the K-12 space? districts serving 47 million public school students. Limited resources for capital expenditure and hiring new IT staff, so must work with what is available. Enterprises more used to dealing with mixed IT environment and more aware of importance of open standards, schools less so. Entry point: One Linux Server Per District (OLSPD), installed and maintained by existing staff in the district. He said the lack of business expansion has nothing to do with the state’s tax structure. “The reason they’re not growing their business here is we don’t have a skilled work force for their position,” he said, adding that the higher taxes will provide more money for education from pre-kindergarten through $50 million in higher education scholarships. What? See if open technology can help provide better education. Provide more options to IT staff and teachers. Open technology was good enough to build the web and is being used in the enterprise. It’s certainly ready for use in education. More software becoming available. Might as well dip toes into water now if you have any interest. In the school, in the classroom, “inside your firewall.” Need to respect school culture, especially the privacy and security concerns. On the web: provide resources, especially case studies. establish more active, vital community. Bring open technology into a school or district to improve IT infrastructure. Provide education about open technology to educators. Demonstrate how they might use it. Provide education to technologists about the possibilities of applying open technologies in education. Why they should engage, how they can help. Try to bring open technologists into schools. Get them engaged. If you’re going to do anything with Linux you need to be able to install and operate a base Linux server. Show it can be done. Need just core Linux networking functionality plus a small number of packages. Hardware requirements are minimal; this provides more options for aging hardware. Engage developers and experts with educators. Engage with regional groups and organizations that have existing relationships with multiple districts. Provide training to staff in those groups so they provide education in open technology and assist in its deployment to interested schools and districts. Track and document deployments to create case studies. It’s not just the relationships but the opportunities that can come from those relationships. The key to all this is building relationships and communities. Thanks to Randy Metcalfe of OSS Watch, U.K. OSS advisory service, for providing most of the content in this section. SchoolForge.org.uk. (This site includes several case studies.) It serves as both an advocacy group as well as a clearing house for information and case studies for this sector. The American version of the same thing is SchoolForge.net. Since government is the main actor in the k12 field, it is only natural that Members of Parliament get involved. John Pugh MP introduced an Early Day Motion in Parliament. One of the results was the founding of the Open Schools Alliance. The other reference is to a newly formed group called the National Open Centre, which focuses on the open source and open standards area Although this is not specifically targeting schools, it may turn its attention that way in the near future. Enterprise-level applications written in Java. Use directed development model called “Community Source” with developers drawn from member universities. Uses industrial strength development model with all work released as open source. use ECL (Education Community License), a BSD-style license, moving to Apache license. Key startup funding from the Andrew W. Mellon Foundation. Web Content, WebDAV, Wiki, Site Setup. Portfolio tools: Forms, Evaluations, Glossary, Matrices, Layouts, Templates, Reports, Wizards. Includes The Open Source Portfolio Initiative, a community of individuals and organizations collaborating on the development of non-proprietary, open source electronic portfolio software. Brandon Elementary transformed by K12LTSP. Open Source, Openness, and Higher Education. Technology Use in Public Education. Working for The Man? Advice to a young programmer. Orwell High School Case Study. Dr. Chuck’s Web Log: K12 Summit. Why Open Source Software / Free Software (OSS/FS, FLOSS, or FOSS)? Look at the Numbers!. IBM: The power of the open approach to transform K12 schools. UNDP-APDIP International Open Source Network. Free/Open Source Software, Open Standards. Nigerian school kids use Linux. Mandriva puts Linux on USB stick. Primer on Open Technologies in K-12 Education.